Soak the sabudana for 3 to 5 hours. Mix together soaked sabudana , groundnut powder, red chili powder , salt, lemon juice and sugar in a bowl. Mix it well and cook it with lid closed for 10 to 15 minutes , check and mix often. Ready to serve & Eat :). When cumin seeds are light brown , pour them over the sabudana mixture and mix well. Microwave it for 4 minutes , every 1 minute keep mixing them. Ready to eat in 4 minutes. 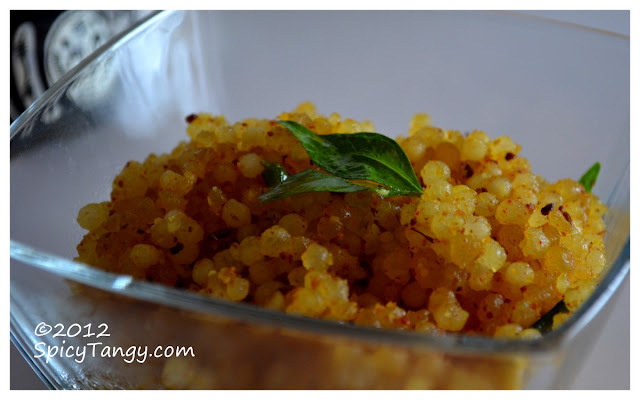 If you feel that you still have to cook the khichdi , then microwave for further 1 minute. When you soak sabudana , make sure that it doesn't become very soft and stick with each other. Normally if you are taking 1 cup sabudana , add 1 cup water and soak it for 3 to 5 hours. its mouth watering have to make it and eat it fast....keep giving these simple receipes so we can try it out.